Ex Creation Wines semper aliquid novi! Situated some 18 km from the coastal resort of Hermanus, Creation is more than a wine farm; it is a glorious destination where a warm welcome awaits young and old. Make a reservation at Creation. Should you decide to visit us on the spur of the moment, don’t hesitate to contact us via phone, e-mail or on WhatsApp (082 921 6435). We may just be able to accommodate you – especially during the warmer months when additional tables are available on our scenic patio and in our delightful garden. You can choose from no less than eight pairings, with our delectable Brunch Pairing starting at 10 am. Creation takes pleasure in bringing you two sparkling events, each involving the collaboration between a top chef from Europe and the talented Creation Culinary Team. Wednesday 14 February (Valentine’s Day) and Saturday 17 February will see the gifted Vladimir Proskurnin from the highly rated Estonian restaurant, Salt joining the Creation team to bring you an evening of first-class cuisine, superbly matched with Creation’s world-class wines. 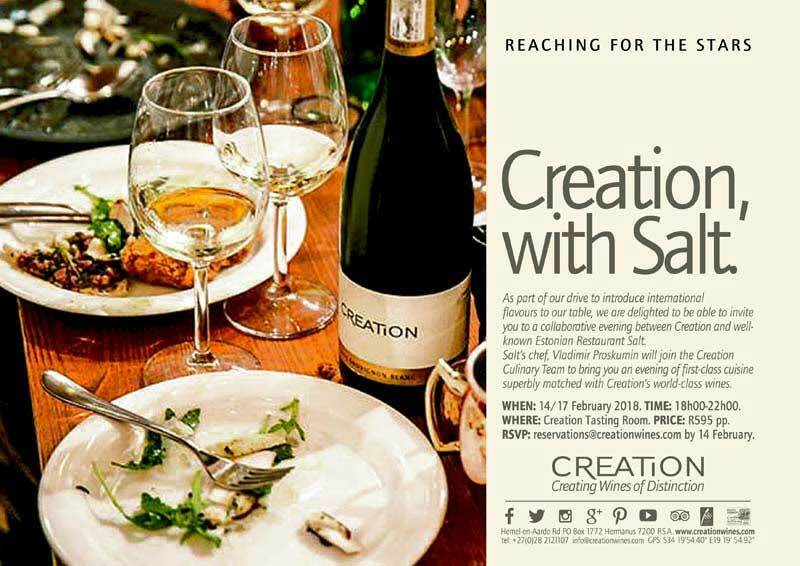 For details, see the invitation ‘Creation, with Salt’ below. Don’t miss out on these festive events: space is limited so book now! The Creation Culinary Team welcomed Chef Thomas Rode Andersen and Sommelier Thilde Maarbjerg from Denmark in their midst. 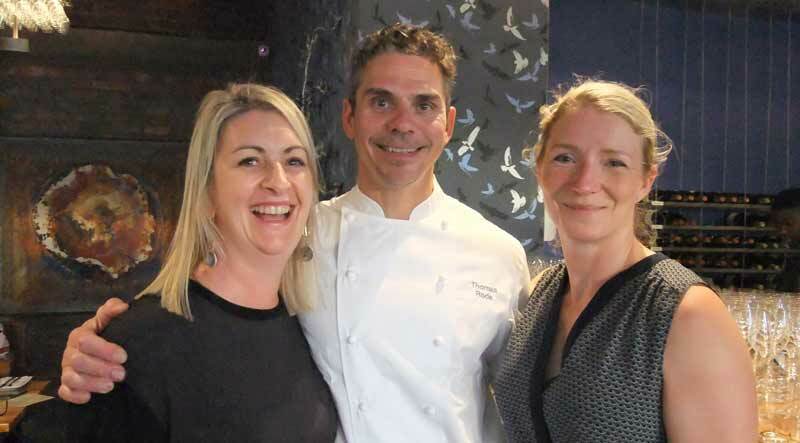 The couple is visiting Creation as part of the ‘Reaching for the Stars’ campaign, an initiative aimed at bringing exciting international flavours to our table. The high-profile Thomas is a Michelin-starred chef and the author of various bestsellers on gastronomy. Thilde is chief sommelier at the wine company Løgismose Vin and regarded as one of Denmark’s leading food and wine experts. Below Thomes can be seen having fun with two members of the Creation Culinary Team.